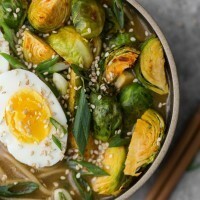 Vegetarian Ramen Bowl with Spicy Brussels Sprouts | Naturally.Vegetarian Ramen Bowl with Spicy Brussels Sprouts | Naturally. Preheat oven to 400˚ F. Quarter Brussels Sprouts and toss with sambal oelek. Roast until the Brussels sprouts are tender and browning, 20 to 25 minutes. In a stock pot, heat olive oil over medium heat. Add in onion and cook for 3 to 4 minutes, just to soften. Stir in the garlic, ginger, and soy sauce. Add in the water, bring to a boil, reduce to a simmer, and cook for 15 minutes. Pass through a sieve, discarding the onion mixture. Return ginger broth to the pan and add in the broth. Bring to a boil, reduce to a simmer, and add the noodles. Cook until the noodles are tender, 7 to 8 minutes. Stir in the 1 tablespoon of the miso, taste and add more as desired. Remove noodles from the heat. In a small pan, add water, enough so you know will cover the eggs. Bring to a boil, add the eggs, and cook for 7 minutes. Remove the eggs and quickly transfer to an ice bath. Assemble the ramen by dividing the noodles into 2 bowls and adding half the Brussels sprouts to each bowl. Add in the eggs and top with diced scallions and toasted sesame seeds. + Adapted from this recipe. + A couple times I’ve made this, I’ve used closer to 2 tablespoons worth of sambal oelek. It really depends on how much spice you want.